Whenever and wherever you ride a motorcycle, the first step is to wear your helmet. Value! The value of the head, that is. While most human beings can live pretty well with a broken limb or some fractured ribs, some less fortunate even being able to still race without a leg or an arm, we think it's pretty obvious that a smashed cranium and splattered brains are really important for life. Breathing, telling the heart how fast it should pump blood to the body, and keeping up with the daily routines of digesting all sorts of food to power up the body, they're all on the list of chores the brain's job comes with. Take the brain out of this nifty puzzle and everything goes down. 6 feet lower, that is. Despite some riders strongly opposing the laws making wearing a helmet mandatory, there's overwhelming statistic data to prove that helmets help saving lives. It's no point arguing here on this subject, since we're trying to help the new riders make a better choice. As a really old rider used to say, "wear the damn helmet and pray you don't get to test it!" A motorcycle helmet is made of 4 main components: the outer shell, the inner EPS liner, the retention system and the comfort liner. The outer shell is the first thing standing between the hard asphalt or concrete and the rather delicate brain. It is designed to provide enhanced penetration protection, while absorbing and disseminating the force of the impact. The second warden of the pudding (yes, the brain looks like a pudding, with roughly the same consistency and "toughness") is the inner EPS liner. EPS stands for Expanded PolyStyrene, and is a high-tech version of the common styrofoam. 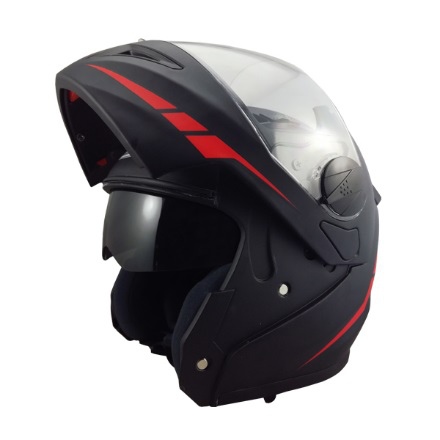 While the outer shell deflects and reduces the impact from the outside, the EPS liner softens and absorbs the energy that your head bangs against the interior of the helmet with during a crash. The retention system, most commonly referred to as a chin strap, but more complex in certain designs, helps keeping the helmet on the rider's head. Finally, the comfort liner is a layer of soft fabric which adds to fit of the lid, enhances moisture wicking and provides a comfortable feel to the face and ears. A helmet's quality is directly proportional with the quality and engineering of these components, but it is more than their simple sum and top-shelf manufacturers will never cut corners making any of these components. One of the first questions for a new rider is what kind of a rider is he or she going to be. That is because any motorcycle can technically be ridden with any type of helmet, but if real protection and comfortable wearing really matter, there are some choices to be made. Basically, helmets can be separated in 5 large categories: half helmets or brain caps, usually associated with badass-look summer riding, ¾ or open-face helmets which are traditionally used with both scooters and choppers, though you'll also see them with riders on small-displacement bikes, flip-up or modular helmets which can be seen everywhere and full-face or integral helmets, most commonly associated with sportier bikes. The fifth category is no-face helmets, but we doubt you want to hear about or see what wearing one and crashing leads to. 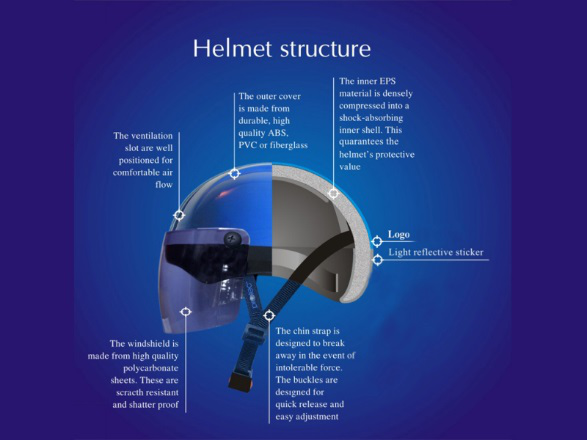 Performance in any direction and rider protection rises accordingly to the enumeration above, with the braincaps being the least safe and the full-face lids the most secure of helmets, but there are many other things to be considered. 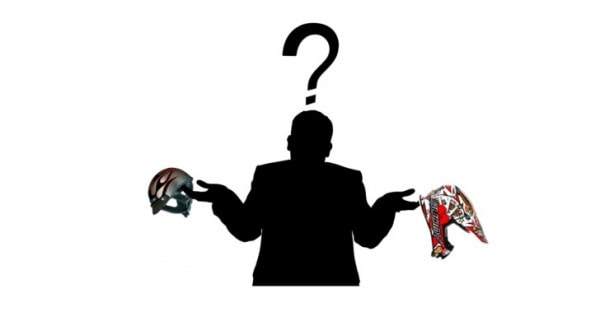 The most important thing when deciding which type of helmet you need is thinking where and when you will be riding. Planning hard enduro or motocross action? Half or ¾ helmets are the shortest way to horrible injury. Getting a bike for occasional summer riding? A braincap could do, especially for the awesome ventilation it offers due to the lack of protective layers around the face. It could do, though. Thinking about spending long hours on the bike eating and hydrating while on the run? Maybe a flip-up lid would be a good idea: open the face piece and chew on a chocolate bar or drink some water, then close it and throttle harder. Eyes set on a supersport bike with track weekends in mind? Go get a full-face one, by all means. Given the fact that the motorcycle helmet is by far the most important piece of protective gear, manufacturing lids which really shield a rider's head is critical. That's why road safety organizations and agencies around the world have created safety standards and are fiercely enforcing them. DOT and Snell in the USA, ECE in Europe, JIS in Japan and AS in Australia are probably the most common. Pretty much like a car must pass certain safety tests and the NCAP crash ordeals, helmets must comply to these sets of regulations and when they do, it means they can efficiently protect the head. Safety standards are all about function and have nothing to do with fashion or any compromise combination of function and sparkle. All safety-certified helmets are reliable down to a certain degree: a $130 (€100) certified lid is most likely to show lesser overall quality than $1,000 (€750) carbon top-drawer one. Anyway, street-experience clearly showed that safety-certified helmets are performing better than the non-certified ones. So whatever lid you might choose, make sure you're getting one certified for your area. The tests the helmets must pass are way more complex than what you'd be willing to believe and involve so much more than smashing some heavy objects against the shell and seeing if it cracks. A huge array of scenarios is involved in the testing process so that once the CERTIFIED sticker is applied to the helmet, the manufacturer and you – the client – can rest assured that it will deliver the degree of protection it's supposed to. Getting your lid from a certified seller is a great way to minimize the risk of spending your bucks on fakes. Printers are quite wide-spread around the globe and pretty much anyone can produce DOT or ECE label stickers for non-certified helmets. Getting a helmet from an authorized dealer spares you the trouble, and can even produce further benefits. Some manufacturers and big retailers offer insurance and replacement programs. Schuberth, for example, will offer a new helmet for about one third of the price of a new one to riders who have registered their new helmets prior to benefiting from their protection during a crash. One of the key elements in the dynamics of the crash involving a rider hitting the pavement or other obstacles with the head is the way the helmet fits atop the pudding and how well it stays in place. That's why all the experienced riders in their right mind would tell anyone that an unstrapped helmet is just a tad more efficient protecting the rider during an accident than a birthday cone hat. In more direct words, if you don't secure your helmet, you might be very well leave it at home. Getting a motorcycle helmet that fits properly on the head is essential for two reasons: a fit helmet (properly strapped) has very little chance to come off in a crash and it ensures minimal movement of the head inside the EPS shell during the impact. Motorcycle helmets come in multiple sizes, usually starting with XS and ending up at 2XL, that is for the interior EPS liner. Some manufacturers also offer a choice in outer shell dimensions for an even better fit and a more accurate size-to-weight ratio. If it sounds a bit weird, just try to imagine a rider who needs an XS interior with a huge XXL shell on the head; the helmets fits well, but it is unnecessarily heavy because of the additional EPS needed. And yes, it looks stupid. Even more, there are innumerable shapes for the human head, and they must be grouped somehow, as custom EPS liners for each customer are still a bit far away. Testing multiple helmets from various manufacturers is also essential to find the right one, provided you're mature enough to skip the color kerfuffle. One of the best ways to zero in the right helmet is to first measure your head. This gives a preliminary hint as to which size you should be looking into. All manufacturers have sizing charts so you'll have an easier time finding your lid this way. Get a measuring tape and place it round your head, 1 inch (2.5 cm) above the ear tips. Write down the number lest you forget it until you reach the shop, and there you go. These measurements are not absolute: since the comfort liner is made of soft foam and fabric, a half an inch margin is usually taken into account. Please note that, let's say, the M size from manufacturer A might fit looser or tighter than the M-sized lid of manufacturer B. As you try on more helmets, don't get scared: your head isn't changing shapes, it's just the fact that each brand has its own architecture. In turn, it also doesn't mean that the higher the price tag, the better the fit for your head. You might be surprised to find out that fit is rather a matter of sheer geometry and not of cash and top-notch colorful graphics, or advertising. A motorcycle helmet must not be too easy to put on or take off, save for the braincaps. The internal padding must provide a snug fit over the head, face, ears and all, without leaving empty spaces. If putting on a helmet requires too much effort, check for your hat as it may be still on your head. If it's not, ask for the next bigger size. After putting the lid on, adjust the strap and try to rotate your head while keeping the helmet in place with your hands. If you can see the inside of the ear pocket after this maneuver, the helmet is too big. If your skin moves slightly with the helmet, then you're getting close. For a good fit, older guys say you should not be able to insert a finger between your head or face and the liner. If you can do this easily, then again, maybe you should be looking for another shape. If you're getting a premium helmet, you might ask for different cheek pads. Likewise, some helmets come with air pockets that can inflate or deflate to provide the optimal fit. If the ears are too compressed and you already start to feel the eartips crunching and burning, it's not the best helmet or size, either.